It's likely that there's never been as much garbage in Chicago's Daley Plaza as there was on Friday, August 19th, but that was OK, because it was almost all within one of the 25 prototypes that were finalists in a competition for the design of recycling receptacles, co-sponsored by the city and the Chicago Chapter of the American Institute of Architect's Young Architects Forum. Can better designed recycling bins boost Chicago's flagging recycling rates? Read all about it, and see a lot more pictures, here. Ray Nordstrand, former President of Chicago cultural icon WFMT, died Saturday morning after a long illness. He was 72. The way things are going, he may be the last visionary to come out of Chicago broadcasting. 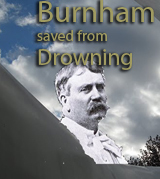 Nordstrand was Daniel Burnham to program director Norm Pellegrini's John Wellborn Root. His artistic sensibility may have been somewhat less than his partner's (although his halting delivery, often affectionately parodied, had a style all its own), but it was coupled to a bedrock business sense. By tranforming the WFMT Program Guide into the highly profitable Chicago Magazine, he created the economic model that sustained what became one of the nation's great radio stations. What CFL or WLS were for rock, WFMT was for the fine arts. 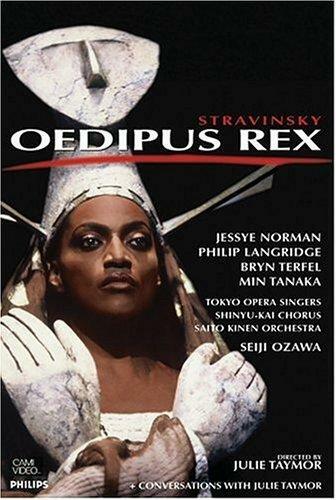 When I began listening to WFMT, I knew nothing about classical music, and I considered opera highly suspect. Within a few years, its programs gave me an education no university could match: not just about classical music, but Broadway, folk, comedy and odds and ends through the Midnight Special, about art, through the critiques of Harry Bouras, about writing, through programs with Herman Kogan, of theater and elegant vitriol from Claudia Cassidy, and just everything else, including justice and fairness, through the interviews of Studs Terkel. WFMT had a set of ethics, an ambition for excellence, and, rare in anything but almost nonexistent in broadcasting, a soul. Today, WFMT still retains remnants of its former greatness but, smothered by the bureaucratic embrace of Windows to the World, Inc., which also runs WTTW, it often appears on the road to becoming the fine arts version of JACK radio. Like so many sectors of the American economy, an elephantitis has set in where marketing rules, and what it's supposed to be supporting brings up the rear, far behind. WFMT began so lean it could be run, initially, by just two people, Bernard and Rita Jacobs. 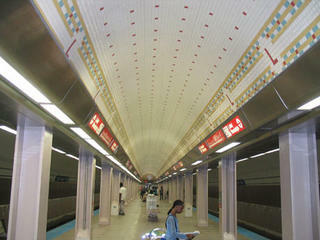 According to an account in the Chicago Tribune, they pawned their car and luggage to buy the station. With radio outlets changing hands for tens, or even hundreds of millions of dollars, who has that much stuff to hock today? If there's a young Ray Nordstrand somewhere out there now (please, God, speed them along) we'll probably find him or her in satellite radio, or on the internet. This coming Monday, August 29th, beginning at 8:00 A.M, WFMT (98.7 FM) will broadcast a tribute to Ray Nordstrand, including reminiscences from many members of the FMT family. His death makes this a very sad day, but for forty years, he gave us a hell of a ride. After being under wraps since January, Anish Kapoor's Cloud Gate sculpture in Millennium Park is again being unveiled for public viewing, this time with most of the seams visible at the time of the park's grand opening last July now polished away. leaving a spectacular uninterrupted. curving mirrored surface. The cost of the sculpture has now officially risen to $19,000,000, more than double the original estimate, and it's still not complete. Beginning in October, its underside will be closed off from the public view to polish away the last exposed seams. Public access, currently curtailed to remove the tent, scaffolding, and clean up the podium, is scheduled to be restored by Sunday, August 28th. 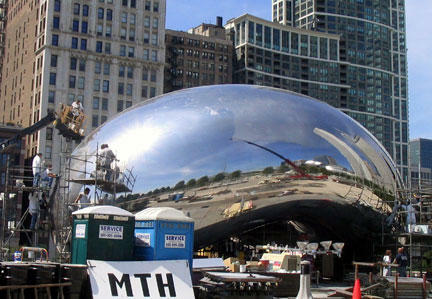 See more photographs of Cloud Gate's unveiling here. Read Emily Nunn's Chicago Tribune story on ironworker Danny Kozyra and how he and his colleagues created "The Bean"'s surface here. 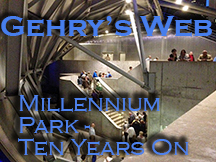 This is the second summer for Chicago's Millennium Park. 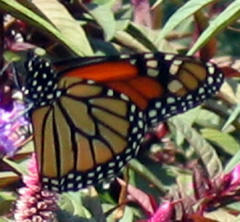 Joining the hordes of tourists hovering around the greenery are contingents of Monarch butterflies. Make sure to look for them among the plantings along the walkways leading into the park from Michigan avenue. 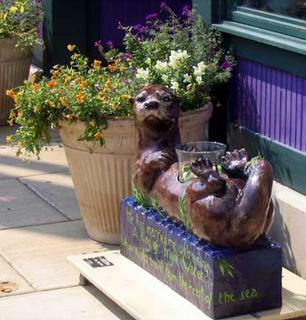 To see a photo gallery of the little buggers, and of the park's Lurie Gardens, click here. Three great articles makes it worthwhile to pick up a copy of today's (Wednesday, August 24th) Chicago Tribune. You also have seven days to catch them on the web before they pass into paid archive hell. Making it Shine Emily Nunn has a very fine story on the polishing of Anish Kapoor's Cloud Gate sculpture from the point of view of foreman and ironworker Danny Kozyra. Jonathan Briggs reports on now the building's original purpose has been destroyed in the spectacular restoration of the Lambert Tree Studios. Why can't Kamin write stuff like this? 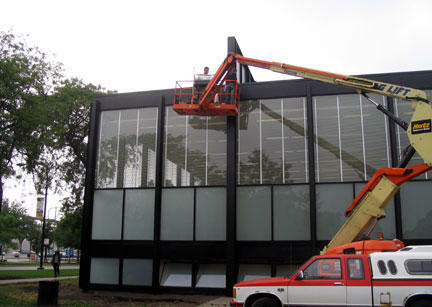 The stunning restoration of Mies van der Rohe's landmark Crown Hall will be the focus of an all-day festival marking its public unveiling. Tours, taking off from the welcome center in the "north lawn tent" will begin at 11:00 A.M., Noon, 1:00 P.M., 2:00 P.M., 3:00 P.M., 4:00 P.M. and 5:00 P.M.
At 11:30 A.M., a tour of Mies' IIT campus will be given by Kevin Harrington, IIT architectural historian, professor and co-author of Chicago's Famous Buildings. At 2:00 P.M. in the Center Core of Crown Hall a panel of Mies colleagues and historians "will share personal reflections and stories." At 12:30 P.M., also in Crown Hall's Center Core, there will be a reading of scenes from "Glass House," June Finfer's play on the relationship of Mies and Edith Farnsworth and the creation of Farnsworth House. 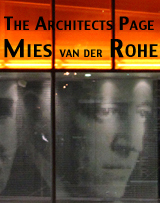 From 11:00 A.M. through 3:00, Crown Hall's Graham Resource Center will hold an open house of the Center's collection, which includes over 6,000 books, journals and electronic resources that serve the College of Architecture, as well as an extensive print collection relating to Mies van der Rohe. The day will also feature four different musical performances, and a number of events for families and chidren. For the complete schedule, click here. The Wall Street Journal ran a story on August 3rd on reaction to the Supreme Court's recent ruling giving state and local governments an unrestricted right to define the seizure of property, even when the benefits accrue overwhelming to private intests, as a "public purpose". The Journal reports that public reaction to the decision has been so overwhelmingly negative that some developers are now backing away from controversial projects rather than be demonized as reverse Robin Hoods, seizing the homes and business of the middle class to hand them over to wealthy developers. Many local governments are also reported to be enacting legislation to put back the protections that the Supreme Court ruling removed. 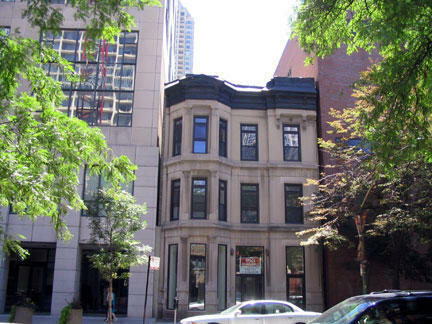 A recent, local example of resistance is the three-story greystone whose owners held out for a price Loyola University was unwilling to pay, and so it survives squeezed between two far newer university structures. Perhaps the most telling Chicago morality tale about the misuse of eminent domain was the leveling of all structures on Block 37. Gone is the McCarthy Building, an official landmark whose designation was repealed by the city council in its great rush to the bulldozers. Gone is the United Artists theater, originally a house for live productions, which could have provided the mid-size theater that the Randolph Theater district so glaringly lacks. Gone is the historic Unity Building, built by Illinois Governor John Peter Altgeld, which Chicago real estate magnate Sam Zell had been talking about acquiring and restoring as a headquarters for his firm. Gone is the Stop and Shop building and store, which, had it survived, would have provided the food hall that the mayor has wanted for the North Loop. And for what? For a decade and half Block 37 has remained a barren wasteland. Without the abuse of eminent domain, many of those Block 37 structures would still be around, probably upgraded and restored by private interests with public subsidy, keeping jobs in the Loop, and paying millions of dollars in property taxes every year. Now and then, a little obstinancy can be a good thing, giving bad ideas and rotten deals time to be exposed, and helping insure that the city isn't homogenized into a generic anonymity. The Hotel Burnham, current resident of the restored 1895 Burnham and Atwood Reliance Building, is promoting its breakfast and a tour combo, the Burnham Breakfast Series. 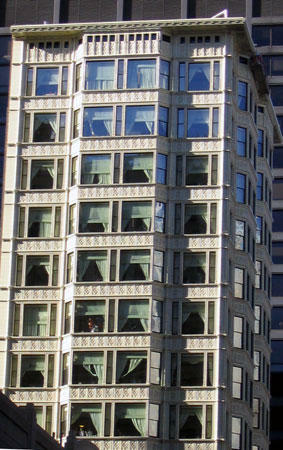 It starts at 8:00 A.M. with breakfast and an introduction to the building in the hotel's Atwood Cafe, followed by an "intimate and informative" 45 minute tour led by a Chicago Architecture Foundation docent. The hotel also promises "a goody bag filled with special keepsakes." (Mini-bottles of shampoo and conditioner, anyone?) The breakfast and tour will be available the second Saturday of each month: September 10th, October 8th, and November 12th. Cost is $25.00 per person, advance registration required. Call 312/762.3521. 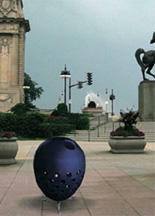 A portion of the proceeds with benefit the Chicago Architecture Foundation. The winning designs for what is billed as Chicago's "first citywide recycling receptacles" will be announced at a ceremony beginning at noon, today, Friday, August 19th, at Daley Plaza. 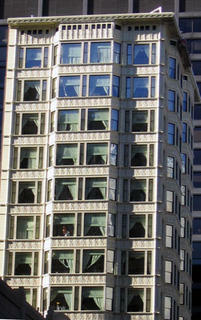 The competition was co-sponsored by AIA Young Architects Forum of Chicago and the City's Department of the Environment. More than 80 creative teams submitted designs for a outdoor recycling receptacle. 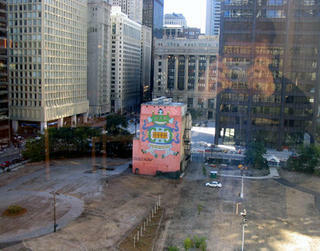 Beginning at 10:30 A.M. prototypes of the top 25 designs will be on display at Daley Plaza. A jury of architects and recycling experts will select winners, and there will also be a "People's Choice" voting for public input. Mayor Richard M. Daley is scheduled to deliver a keynote address at noon, with the winning entries to be announced at 12:30. If you want to check it all out, do it now, because the prototypes will be on display only until 8:00 P.M. on Friday, the 19th. 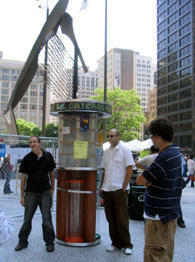 The City of Chicago’s “Live Green” exhibit showcasing recycling strategies and products, will also be on display. 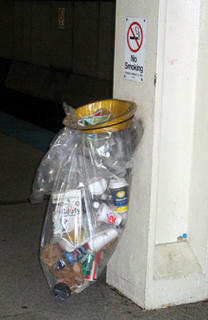 CTA Curates "Trash Worlds", on display at selected subway stations. It cost $15,000,000, but the Skidmore, Owings & Merrill redesigned Lake Street station on the CTA's Red Line is money well spent. When its nearly empty, there's something almost temple-like in the brilliantly lit platform with its procession of white columns and uninterrupted, block-long mosaic vault. At rush hour, when crammed trains disgorge horde and after horde of rushing, intent passengers, it's got the popping, romantic energy of a Gershwin rhapsody. Step south of Randolph, however, and you're suddenly plunged into the scene from Beethoven's Fidelio where the prisoners are forced back down into the dungeon. Have platforms like the one at Washington ever seemed more dark and decrepit? At one section, five successive fixtures lighting the track are out of order, plunging the station into a gloom so deep that even the rats take Prozac. You would think the most logical priority would be to bring all Loop line stations up to standard as quickly as possible. But, as reported by Greg Hinz in Crain's Chicago Business, the agency is hell-bent to shift $42 million in city TIF money and $130,000,000 in CTA bonds to construct a "superstation" under the chimera known as Block 37 to serve a $500,000,000 express service to the city's airports that the CTA's own consultant has estimated will carry a grand total of about 6,000 passengers a day. Meanwhile, back at the Washington Red Line station, the CTA has now apparently decided to rub the noses of riders in its indifference by treating discarded garbage as a new form of public art. Old trash receptacles have been replaced with transparent bags hanging listlessly off of metal rings. To commuters who happen to be anthropologists, these let-it-all-hang-out exhibitions of trash both mundane and disgusting may be objects of endless fascination (quick tip: the lighting of the refuse is better at Clark and Lake), but for the rest of us, it makes waiting for a train a little like visiting a landfill. The CTA has so far declined to respond to questions about why the bags exist. If they're thinking it's a security measure, we're all doomed. Bad guys could easily make a nasty parcel inconspicious simply by wrapping it in a newspaper. Right next to the bags are big newspaper recycling boxes whose contents are completely shielded from view. Morever, it's only at certain stations that we're being given the honor of contemplating our own refuse. But it's pointless to speculate. The mind of a bureaucrat insistently remains a thing of mystery. Let's just hope the CTA takes aside whoever thought this was a great idea and sends them out for counseling. Chicago area schools are being invited to participate in the 2006 Chicago Regional Future City Competition, which asks 7th and 8th graders to design their visions of the city of the future, first on computer and then as a 3-D model More than 30,000 students from 1,000 schools participated in last year's competition, sponsored by the National Engineers Week Committee, a consortium of engineering associations and major U.S. industries. Co-chairs of 2006 National Engineers Week are the Society of Women Engineers and Northrup Gruman Corporation. 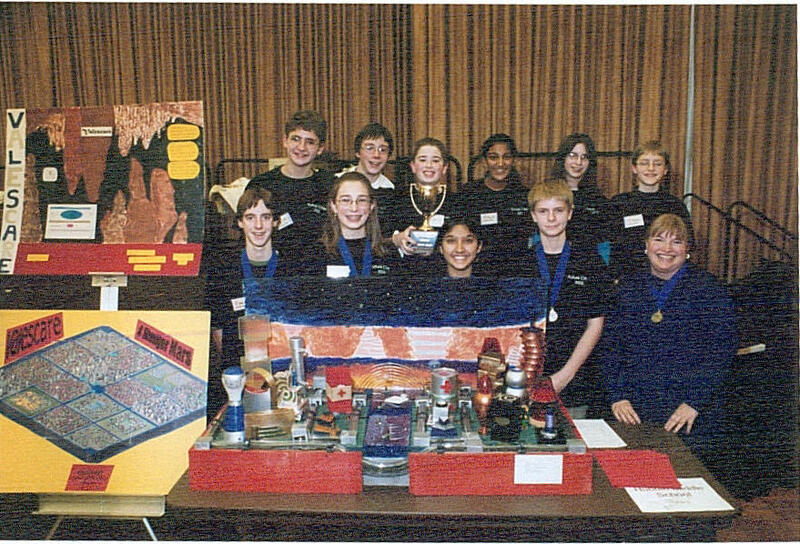 Regional first place teams receive a trip to the national finals, held in Washington D.C. next February 20-22, 2006 during National Engineers Week. Prizes for the 2006 competition winning Future City team include a trip to U.S. Space Camp in Huntsville, Alabama. Other prizes include scholarships, computers and savings bonds. Chicago Schools wishing to sign up, or engineers interested in volunteering as mentors should contact Don Wittmer, Chicago regional coordinator, at 312/930.9119 or via e-mail. For Competition materials and registration go to www.futurecity.org, and more information is available at the Future City - Chicago Competition home page. The deadline is October 15. The complete press release is included in the first comment to this post. no thing, an exhibition of the work of 4240 Architecture's Robert Benson, is currently on display at the TOJO Gallery at 1418 West Division. It includes 13 small photos ringing the gallery with six large photos 54” x 80” printed on unique materials hovering in the center. "The show," says Benson "is about finding beauty in the mundane ... looking at things and people that are often overlooked." 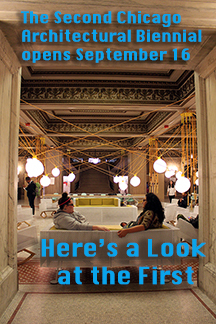 The gallery is open by appointment only, but will be open to the public on the show's closing day, Friday, August 26th. For more information, call 773.726.4545 or contact the gallery by email. In our never-ending efforts to bring architecture news and my ramblings to the masses, you can now subscribe to ArchitectureChicago Plus and add it to your news reader. If you're already using RSS, you know what to do with this to get it into your reader. If you don't, but want to learn more about how RSS can help keep you up to date, here's a basic overview from Robert Teeter, and an extensive article from Wikipedia. Eventually, we'll have one of those nifty orange XML buttons you can just drag to your newsreader, but for now you have to set the channel up yourself. Can podcasts be far behind? Architecture for Humanity Chicago has announced it's first design competition. Next to the international organization's projects creating homes for victims of Hurricane Emily, designing mobile health clinics to fight HIV/AIDS in Africa, and has assisting in the rebuilding after last year's Tsunami, the subject of the Chicago chapter's competition is bound to seem a bit of an anti-climax. The competition brief for new STAND cites "the daily interaction between reader and news vendor" as part of the dynamic of a healthy urban streetscape. It directs that competition entrants address "a) the decline of print media; b) the positive effects of community business; and c) small scale architectural impact on the streetscape." The application deadine is 5:00 CST, October 1st. The fee is $35.00, $15.00 for students. Interested parties can email afhchicago@gmail.com to request an applicaton. The way the automated box now dominates the streetside sale of newspapers suggests that participants have their work cut out for them. Doug Garofalo's entry to the Art Institute's recent Ten Visions exhibition included a design from one of his students for a public digital information kiosk. Will there still room for newspapers and magazines (and the people who sell them) in the depersonalized, hyper-efficient supply chains of today? 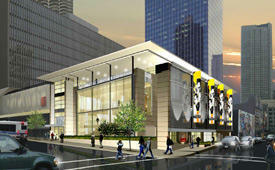 Work is now underway to convert a long-time parking garage on the southwest corner of State and Kinzie into the new home of Chicago's Museum of Broadcast Communications. Designed by Chicago firm Eckenhoff Saunders Architects, Inc. in partnership with sustainable design architect Helen Kessler, the 70,000 square-foot facility is expected to be the first public museum in the nation to earn a gold LEED rating. 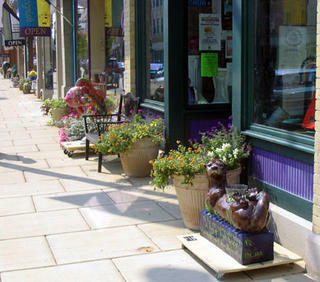 When completed in 2006, the $21,000,000 project will represent a major rescue of a corner that for decades has been a grungy, back-alley presence, dominated by a car ramp inadequately hidden behind a stark concrete wall. A five person jury has selected eight architects to participate in Stage II of a competition to design the Salvation Army's new $60 $70 million Ray and Joan Kroc Corps Community Center at 47th and State Street in Chicago. Included in the list are Chicago firms Murphy/Jahn, Ross Barney + Jankowski, and Booth Hansen, as well as Antoine Predock, Rogers Marvel Architects, PPLC and Hood Design, Mack Scogin Merrill Elam, Behnisch Architects and Charles Rose Architects. The eight will submit their proposals to the jury on September 8th, which will then narrow the list to three or four firms for a final phase that will conclude with the selection of a design team in late October. It's been closed for a quarter century, but activists are still trying to save the historic Uptown Theatre at 4816 N. Broadway. 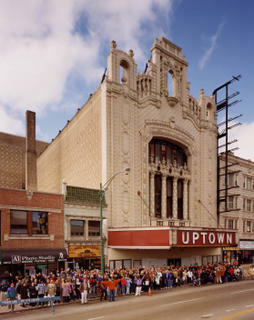 At noon, on Saturday, August 20th, poet Marc Smith will emcee "Uptown Community Portrait 2005," where community residents and architecture buffs will pose in front of Chicago's largest surviving movie palace for a portrait that will replicate similar shoots taken at the theater's opening in 1925, and again in 2000 (shown at left). 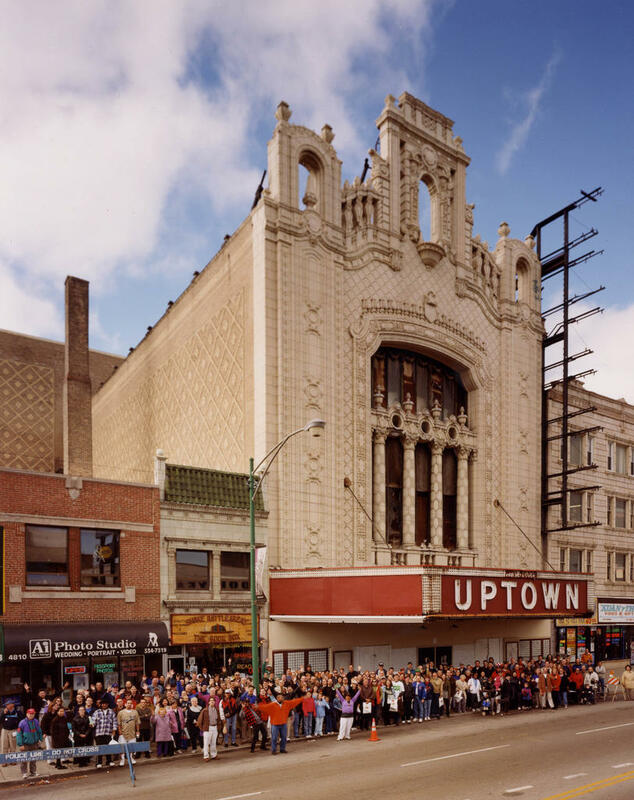 Although officially designated a Chicago landmark, the Uptown is in dire need of funds to maintain the huge structure, and as well as an investor with deep-pockets and a viable business plan for making the 4,000+ seat neighborhood venue economically self-sustaining. For more information, email to Friends of the Uptown, call (773) 250-7665 or (773) 878-1064, or view the Web site. The full text of the organization's press release can be found in the first comment to this post. A long, hot summer overheats one of the Crown Jewels of Chicago's Millennium Park. The first of Millennium Park's crowd-pleasers to develop a major problem was the Bean, as Anish Kapoor's Cloud Gate has come to be called. An enormous public success when favorite since its unveiling last July, the sculpture's been mostly hidden inside a tent since January as workers grind down and polish the seams between its 168 metal plates. In the process the original budgeted cost has almost doubled, to $17 million. 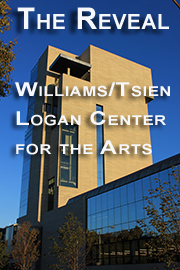 According to Karen Ryan, spokesperson for the Department of Cultural Affairs, no completion date has been set. Now there's been a meltdown at Jaume Plensa's award-winning Crown Fountain, the shallow sea of water stretched between two 50-foot tall towers whose LED panels project an array of more than 1,000 different faces that spout water from pursed lips. 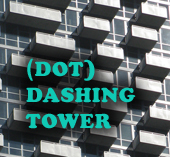 Recent visitors have noticed "dropouts," blank spaces interspersed like zits on the faces of the south tower. Saturday, August 27th, IIT will host a day-long festival to mark the reopening of Mies van der Rohe's 1956 S.R. 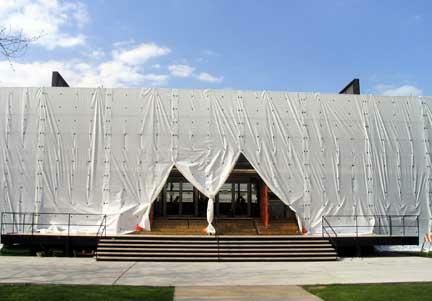 Crown Hall, closed this summer to undergo a complete restoration. A full day of family-friendly activities is being promised, including tours, a performance of "The Glass House," June Finfer's play on the creation of Mies's Farnsworth House, and "some of Chicago's top bands, all under a tent on Crown Hall's expansive lawn." Times are from 11 A.M. to 6 P.M. Location is 3360 S. State Street on the Illinois Institute of Technology campus designed by the master, himself. All events are free and open to the public. For more information, call 312/567.5014 or go to the website. After the Lion King, is there any more famous or lauded director today than Julie Taymor, a status confirmed again by her magical production of The Magic Flute for the Met this season? Add in Sophocles, Stravinsky, Jean Cocteau, Jessye Norman, Seiji Ozawa and a young(er) Bryn Terfel - if this production of the opera Oedipus Rex doesn't offer an all-star lineup made in heaven, what does? Marc L'Italien has closed the EHDD Architecture (Esherick Homsey Dodge & Davis) Chicago office and headed back to the mother ship in San Francisco. L'Italien was the architect behind the Factor 10 House built last year in Chicago's Hermosa neighborhood, a prototype of sustainable design that was one named one of 2004's Top Ten Green Projects by the American Institute of Architects. The latest EHHD design in Chicago, the Pritzker Family Children's Zoo, at the city's historic (and free) Lincoln Park Zoo, opened just last month. "It's a North American habitat featuring black bears, red wolves, river otters and beavers," says L'Italien. 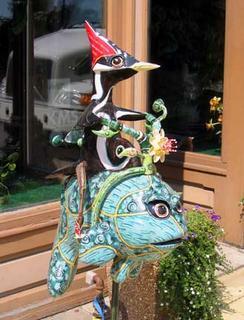 "It's unique in that it is the fusion of zoo, aquarium and children's museum in one project. The hallmark feature is a tall climbing structure inside the exhibit pavilion. We created an instant forest." 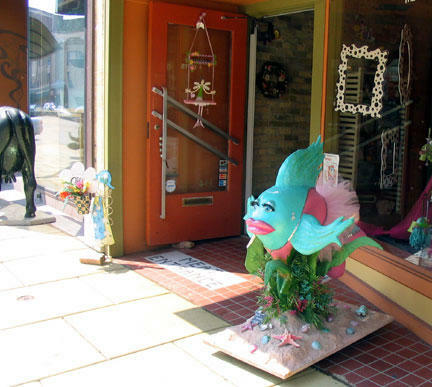 "My plan is to remain involved in projects in the Midwest," says L'Italien." So the restaurant has come up with a nifty solution. They've created an attractive dining patio in what was essentially a fire escape well wedged in between the back of its vintage 1895 building, designed by architect Henry Ives Cobb, and the Bertrand Goldberg designed office building, part of the Marina City Complex, which now houses the House of Blues Hotel. The architect has basically inserted a faux structure that successfully mediates the high grunge level of the original well. Striped glass panels are used to conceal both the lower levels of the fire escape and another alley-like driveway at the back of the patio. 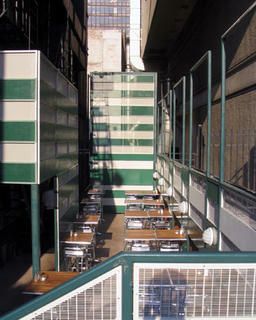 A shorter, green and white metal panel wall covers up the raw concrete wall at the rear of the hotel. 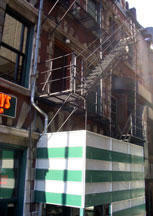 A succession of tall metal frames, painted green, further define the space. All and all, an attractive oasis from the usual streetside cafe where, like it or not, you share your dining experience with every passing pedestrian. FM radio station WFMT, once one of the crown jewels of the Chicago cultural scene, is one step above an abandoned building. Need proof? Consider last night, Sunday, July 31st. At 8:00 P.M. , Henry Fogel's taped Collectors Corner program, which runs until 10:00, began. Last evening's edition was devoted to the work of the late conductor Klaus Tennstedt, and after a performance of the Smetena's Bartered Bride Overture, Fogel urged listeners to stay tuned for a final work, Beethoven's 9th Symphony. Except that, when he returned from break, Fogel was bidding his listeners farewell and offering a preview of the next week's show. Beethoven's 9th had disappeared, but WFMT's feed plunged on, blissfully unaware that over an hour of programmming had suddenly vanished. 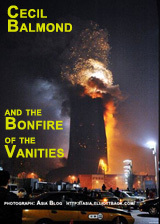 The announcer-in-a-can told us it was time for 10:00 P.M's Vocal Scene. It was 8:48. It appears less that someone was asleep at the switch, than there's no one at the switch. Not that long ago, what is now the city's only classical music station issued a press release announcing with great fanfare that it had decided to create a more undisturbed sabbath for its listeners by dropping all Sunday newscasts, a risibly and transparently self-serving rationalization for still more staff cutbacks.